You must have the same user e-mail address in Zendesk as in Slack or Gsuite to identify which user makes calls and log the right user name in the Zendesk ticket. A Zendesk chat window will automatically open. Please enter your zendesk credentials ID and submit. 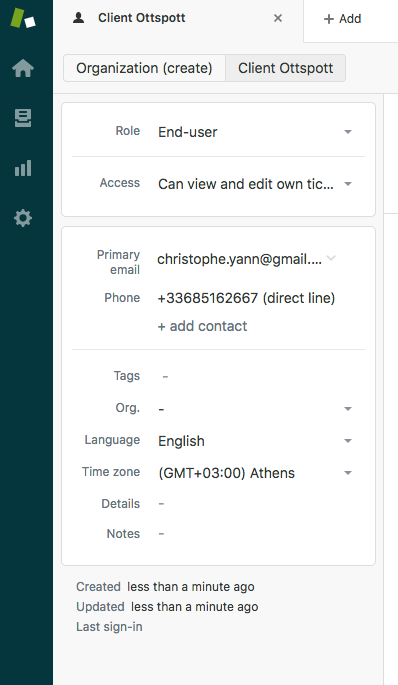 if you would like to log your calls in Zendesk Ticket you will need to create a webhook. Click on the expand buton for Zendesk Integration and checked each call action and each Ottspott number you would like to log the activities in Zendesk. How does it look now with Zendesk ? Now with Ottspott desktop app when you receive call from a Zendesk contact you will can see in chrome notification the name and tag of zendesk contact. Also directly from the Ottspott chrome app you will can create or update ticket just by clicking on the Zendesk logo.